The house is part of the historic medieval colonnade at the tranquil, traffic free heart of the village, looking out onto church, tower and 'village green' and just a few yards from the café/restaurant and village shop. The village was featured in Musketeers starring Catherine Deneuve, who uses our front door! An ideal quiet retreat or a centre for more active exploration. Located at the heart of ancient Gascony with Armagnac, St Mont and Madiran vineyards, historic villages, the local area is full of places to see and things to do from wine tasting to music, with the international Jazz in Marciac festival taking place in August in the next door village. Within a few kilometres, there is a market in a different town every morning and restaurants nearby to try local specialities. The Pyrenees can be seen in the distance from Tillac, with the ski resorts of St Lary and La Mongie within 1 1/2 hours, lunch in Spain easily achievable and Atlantic coast at Biarritz in around 2 hours. Activities: Tillac has its own tennis court and golf course. Water sports and swimming are within easy access in the numerous leisure lakes in nearby Marciac, Mirande, Plaisance, Mielan. Walking includes the St Jacques de Compostelle pilgrim route passing through edge of the village and is close to the Pyrenees which also gives access to skiing - you can be on the slopes within an hour and a half. Gastronomie - the immediate area is becoming a centre for excellent food with a number of new restaurants opening within a 10km radius over the last year, including the village restaurant, which we have personally vetted!!! Of course every meal has to include the local wines from St Mont and Madirans to the Bas Armagnacs to finish. Events - Tillac and nearby: The Marciac jazz festival (JIM) takes place early August with international stars which have included Ray Charles, Nina SImone, Diana Krall and Dee Dee Bridgewater in previous years with Wynton Marsalis as resident. Tillac has it's own flower festival (April), antiques/brocante fair(mid May) and annual fete in July as well as a number of other events during the year including excellent classical music concerts. Guest Comments: 'We had a lovely time in Tillac. The whole area was enchanting, and the people charming. Thank you for opening your apartment to us.' Julie GL - California. 'First day back to work - I know where we would rather be! We live near Bristol and have always loved visiting France and enjoying the lifestyle and culture. As an academic Ann particularly finds the tranquillity good for thinking and writing. We were introduced to Tillac and our house by friends almost twenty years ago and instantly fell for it and the village. From immediately outside the house we can head off for a quiet walk or saunter along to the café / restaurant or to the épicerie to pick up bread and croissants. Our house is a medieval building in which there are some low beams and steep staircases which may be unsuitable for those with limited mobility. As it is also half timbered, we ask guests to respect 'no smoking' in the building or to leave the log burner (in one apartment) unattended. The house is arranged as two 2 bedroom apartments which enables two families travelling together the advantages of privacy whilst enjoying time together. Linen can be provided for a small laundry charge of 10 euros per person (bedlinen, towels, but not beach towels) The tennis court is 100 yards away and there are swimming pools with chutes etc. in the neighbouring villages as well as local lakes with beaches and safe swimming nearby. away from it all which takes you back in time. very comfortable in a magic setting which takes you back in time.exelent position for trips to Andora and towns in the south. would recommend this property but must have a car.would book again. pour conclure faite une visite dans ce village hors du temps. Location très bien située dans un village magnifique à 10 minutes de Marciac, idéal pour le festival Jazz'in Marciac. Très bon accueil par la personne chargée de remettre les clés. Malheureusement, concernant l'appartement en duplex, de nombreuses choses sont à revoir mais principalement les aérations qui sont inexistantes. Toutes les fenêtres du bas (séjour, cuisine) sont condamnées et il n'y a pas de fenêtre à l'étage (chambres et salle d'eau). Un ventilateur dans chaque chambre ne fait que brasser l'air chaud: 29°C la nuit dans les chambres et davantage dans la salle d'eau. Manque d'air et difficilement respirable: manque d'hygiène! Depuis que je pars en vacances en location (plus de 20 ans à raison de 4 à 8 fois par an), je n'ai jamais vu cela. Je dois noter que c'est la première fois que je suis déçue sur Abritel. Cet appartement doit être retiré de la location. Tillac is situated between Auch and Tarbes about an hour north of the Pyrenees, next door to Marciac and close to the St Jacques de Compostella pilgrim route. Conveniently situated to take advantage of Ryanair, Fly-be, BMIbaby, Easyjet etc. through airports of Pau, Toulouse, Biarritz, and Tarbes, also Bordeaux, Carcassone and Bergerac within a reasonable distance and Bilbao a little further on. TGV direct to Bordeaux, and on to Tarbes, Pau and Toulouse. Tillac is less than an hour from Lourdes with the Spanish border towns and ski resorts, Cauterets, St Lary, La Mongie a little further, with spectacular walking destinations such as Gavarnie, Pont d’Espagne. Atlantic resorts of Biarritz and St Jean de Luz are 2 hours away. 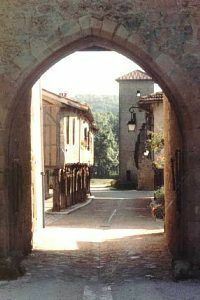 Medieval Gascony is visible in local villages and towns such as Fources and Larressingle. Our house is situated at the end of the colonnade, a monument historique, facing the church, alongside village green, tourist office and medieval tower. There are a further 5 courses in le Gers two with 18 holes and another 6 in adjoining Haute Pyrenees all in attractive areas from Lourdes to Luchon frequently overlooking the Pyrenees.